After finishing a game suspended by rain Sunday, the Cubs shut down the Captains in the second game of their doubleheader. 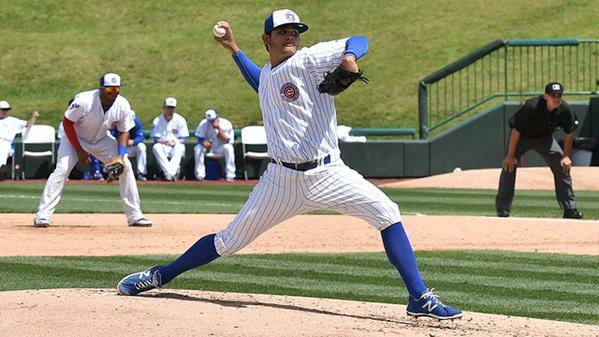 Cubs RHP Erick Leal (4-3) held the Captains to two hits and two walks in five shutout innings. He struck out one and hit a batter. RHP Brad Markey and LHP Jordan Minch each pitched a perfect inning in relief of Leal. Andrew Ely and Kevin Encarnacion each hit a solo homer for South Bend. River Bandits RHP Akeem Bostick (2-1) held the Bees to one run on nine hits and a wild pitch in six innings. He struck out three and walked none. Jason Martin and Jamie Ritchie each had three hits for Quad Cities; Martin drove in two runs. QC’s Kristian Trompiz and Burlington’s Fran Whitten each hit a solo homer. The Whitecaps scored five runs in the 1st and two runs in the 2nd to take an early lead they never relinquished. Joey Pankake and Michael Gerber each had three hits for West Michigan; Pankake drove in two runs and Gerber drove in one. Zach Shepherd also drove in a pair for the Whitecaps. Trae Santos hit a solo homer for the TinCaps. No. 8 hitter Chris Carlson led the Lugnuts offense with a 2-for-3 performance that included a walk and three runs batted in. Gunnar Heidt also drove in a run for Lansing. Narciso Crook hit an RBI triple for the Dragons. Minnesota Twins LHP prospect Stephen Gonsalves was promoted Monday night after taking a no-hitter into the 7th inning for the Cedar Rapids Kernels earlier in the day. He struck out 11 batters, walked four and gave up two hits in seven scoreless innings. Gonsalves went 6-1 with a 1.15 ERA, 77 strikeouts and 15 walks in nine starts (55 innings) for the Kernels. He is tied for the most strikeouts in Minor League Baseball. His ERA leads the Midwest League and is the third-lowest in MiLB. This entry was posted in Burlington Bees, Cedar Rapids Kernels, Dayton Dragons, Fort Wayne TinCaps, Lake County Captains, Lansing Lugnuts, Midwest League, Quad Cities River Bandits, South Bend Silver Hawks, West Michigan Whitecaps. Bookmark the permalink.